Our Tech Gives Us A Leg Up! Pictured here are a few of the appliances SERVPRO utilizes when it comes to water damage. 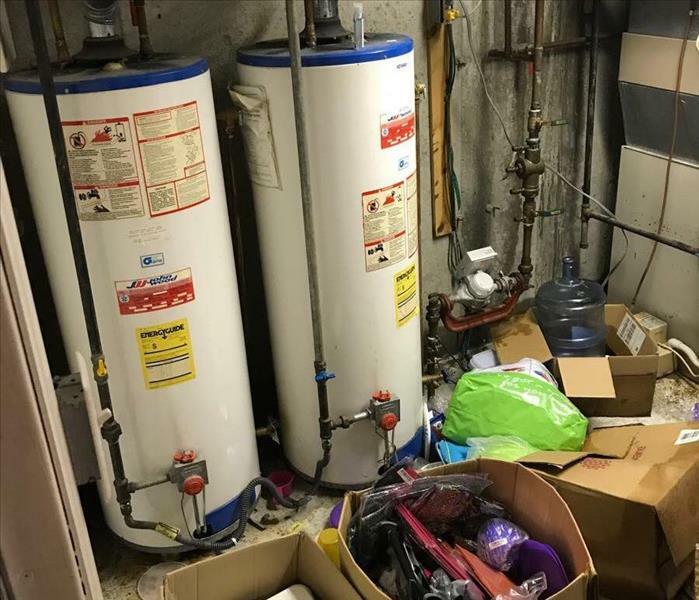 Our air scrubber, drying fan, and dehumidifiers can all be seen here providing a remedy to a basement that sustained water damage. 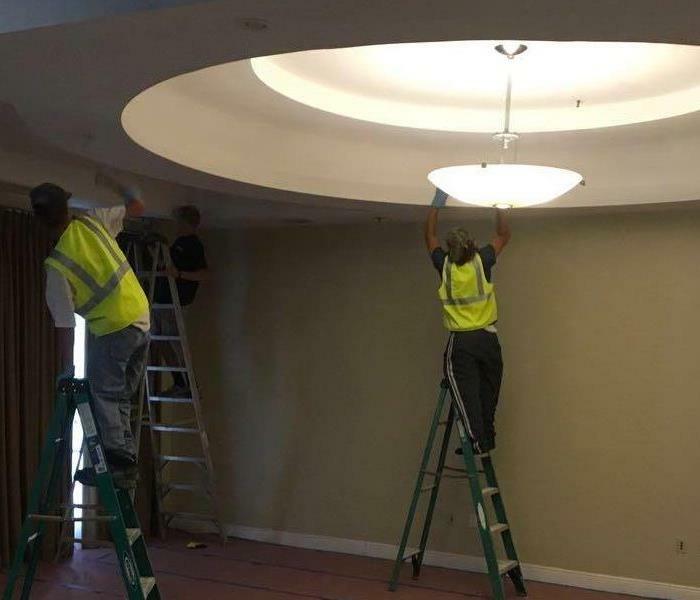 We work hard to remedy all issues before they become larger and more costly! A Prepared Team Is Key! 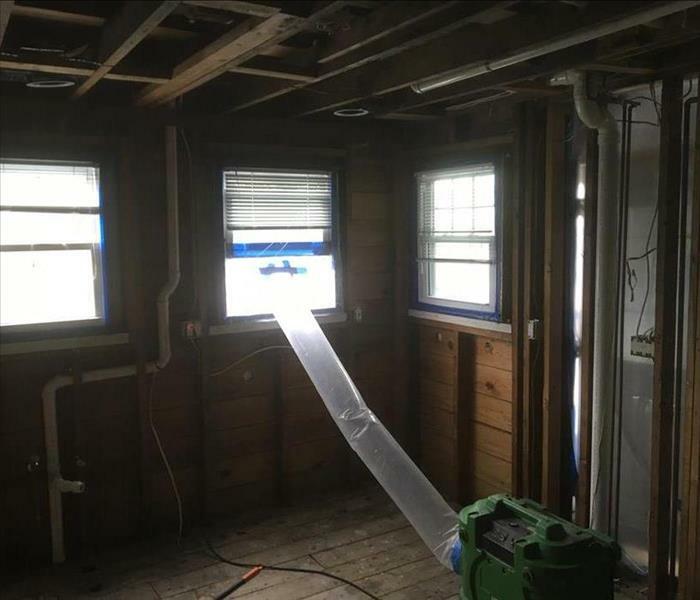 When water damage strikes, we come prepared! 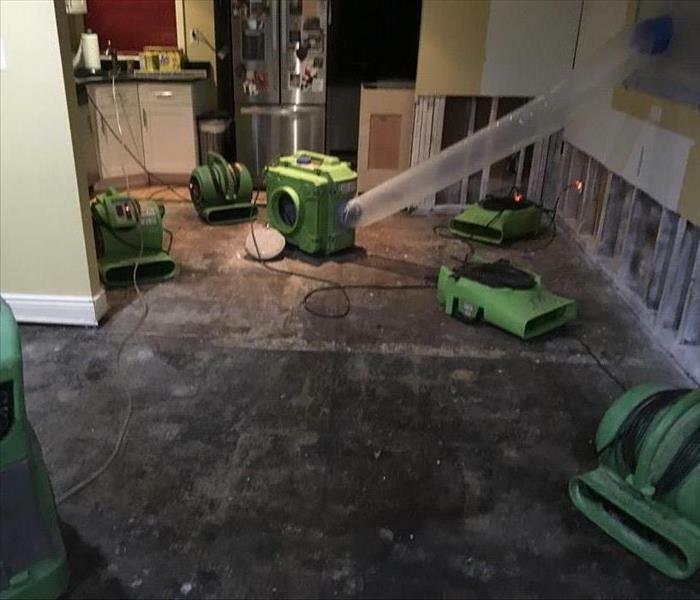 This photo showcases how we use a multitude of appliances to rid areas of water damage. All of these tools have a specific function and work in sync with the others to purify air, dry it out, and move it out to allow for clean fresh air in. Saving Money & Working Faster For You! Getting the job done right AND saving our clients money is a big goal of ours! 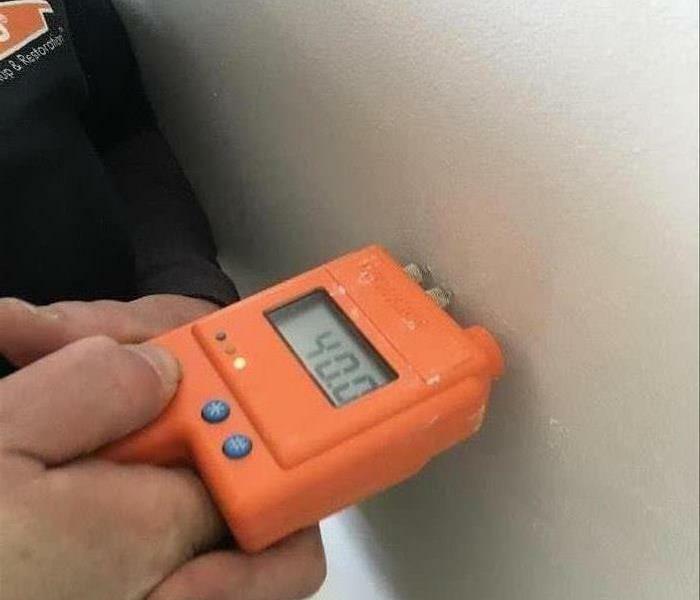 In this photo, you can see us using a moisture meter to precisely detect where moisture is present behind a wall. 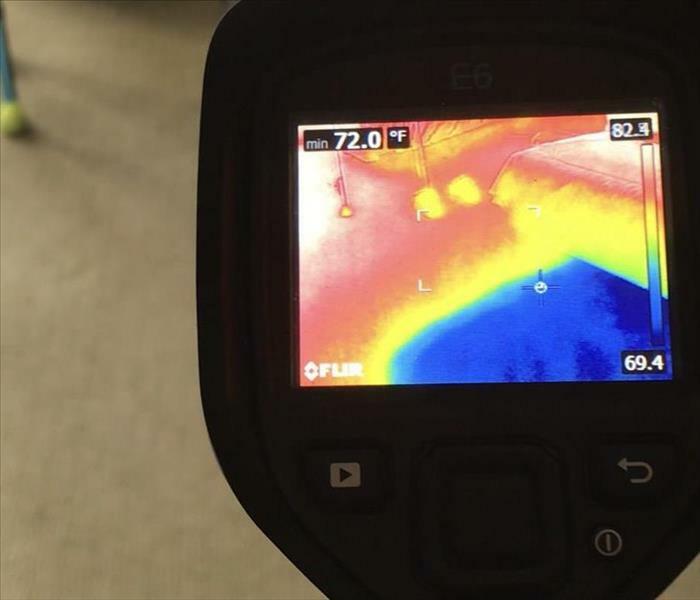 This non-invasive technology allows us to pinpoint where it is we need to be conducting our work, and saves a ton of time and unnecessary work. 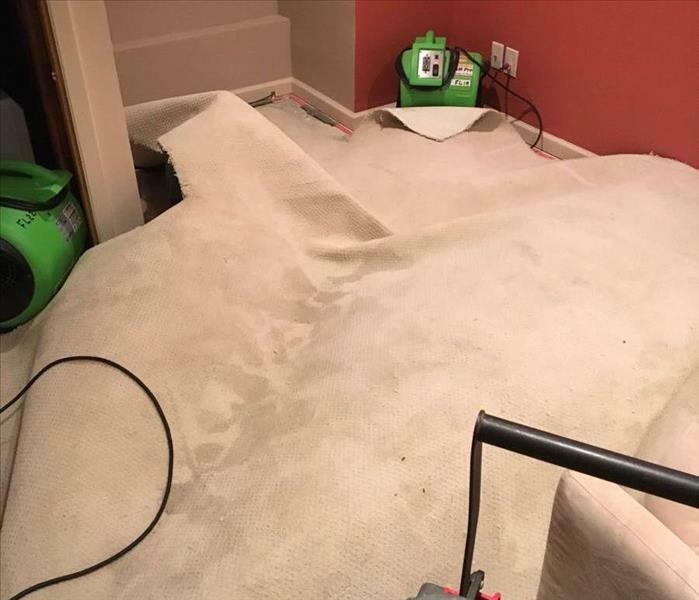 When water damage occurs on a carpet, many fear that it needs to be totally removed and replaced -- but there are viable options that provide an effective solution. We used a special process here called ‘partial carpet floating’. 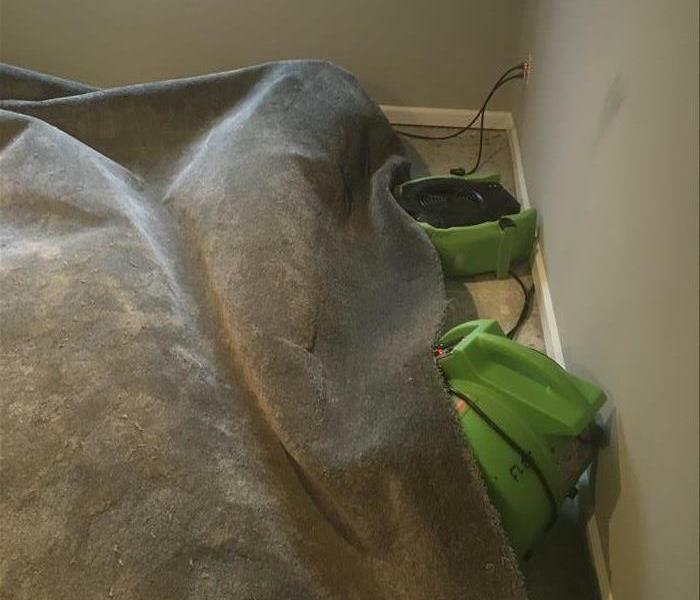 This consists of lifting the carpet from the tacking in one area, and placing an air mover in the space to promote hot, dry airflow under the carpet, and on any other affected areas. This provides an effective solution with less invasive work needed! Water Damage Fixed The Right Way! 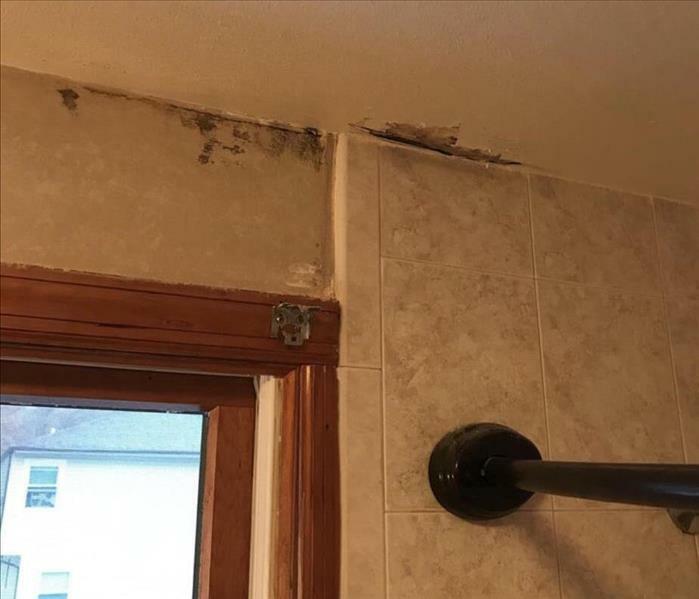 When water and mold damage is discovered, it can be worse than originally expected -- and when that occurs, extensive work is needed to really fix the issue. 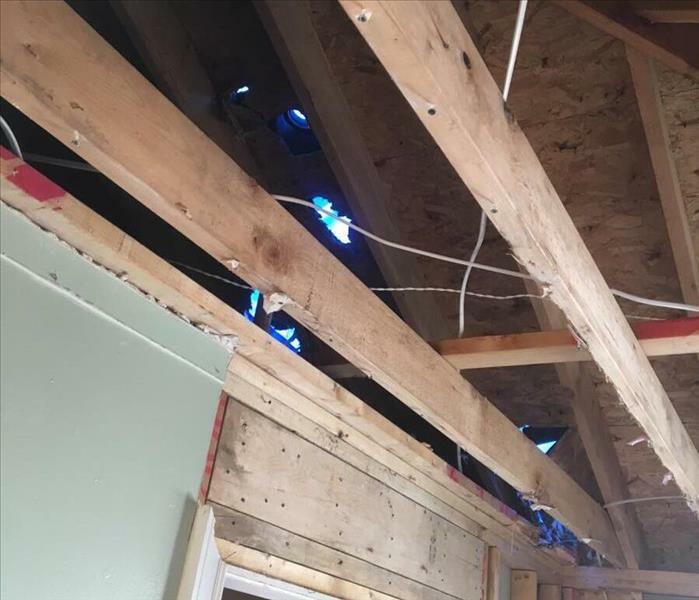 SERVPRO quickly removed the surrounding sheetrock and insulation from this basement in order to clean the affected area. We also placed air scrubbers in the area to rid the air of pollutants and remove particles from floating around after the removal. Due to a heavy rain & windstorm, a tree fell on this local house causing extensive damage to the exterior and allowed water to filter in through the damage. 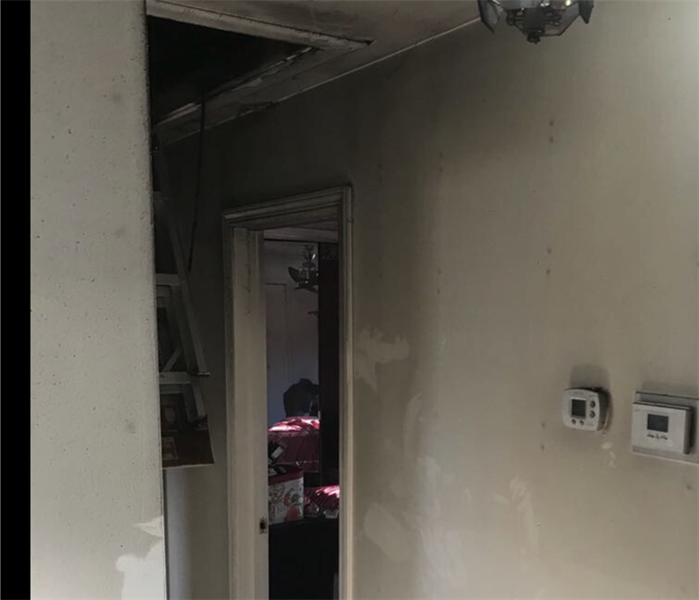 SERVPRO was on the job quickly to mitigate the issue and prevent more damage from occurring! During last year's intense winter storms, homes sustained damage to due the harsh nature of the season. 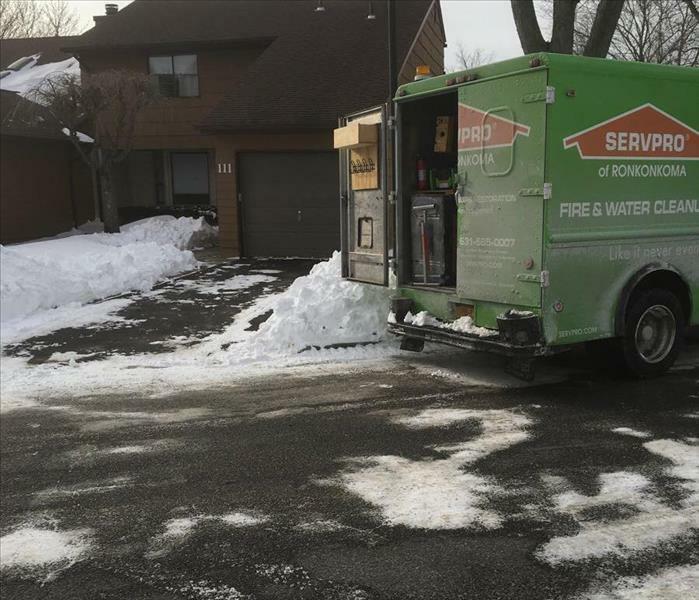 SERVPRO of Ronkonkoma was on call and able to make house calls when it was needed for ALL types of damage! 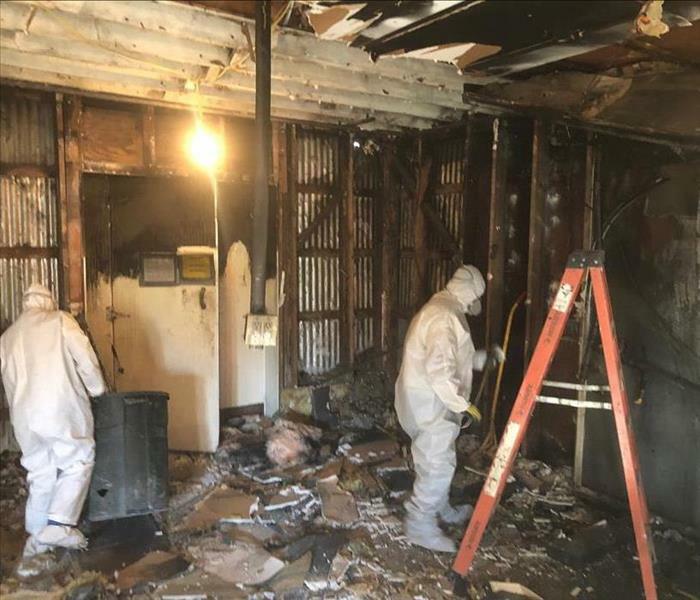 Fires can rip through rooms quickly, and it's important to make sure that any damage is taken care of immediately and properly afterward so that remediation can begin quickly! Faulty Wiring can cause electrical fires, which in turn can cause damaging fires. 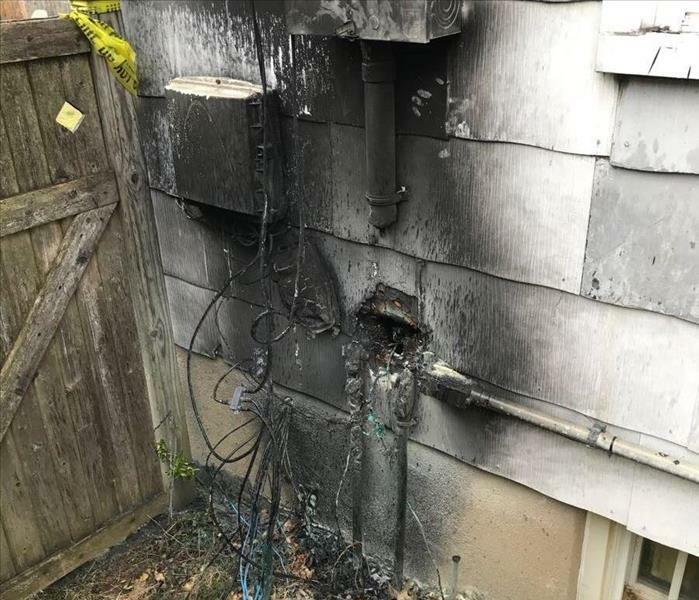 It was important to clean the wiring and the source of the damage ASAP at this home before things were repaired. 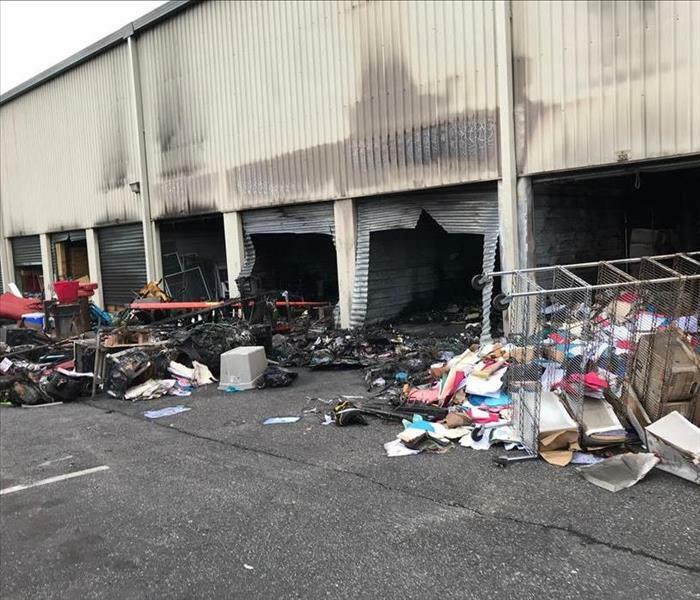 After a water sprinkler broke and flooded a commercial space, this local business needed a way to get back on their feet after damage -- and quickly! We jumped right into action to remediate the issue and dry things up! We go to great lengths to do whatever we can to try to save our customers belongings. In this case, we “floated” the carpet, to try to dry it from underneath, in an attempt to save them from having to replace their carpet. Unfortunately, it was stained beyond repair and it had to be removed. While most of us look at open space in our home and instantly think "storage", sometime's that's just not the case. With utility spaces often boasting a little extra room, it's important to remember that your belongings shouldn't be stored in them, due to the possibility of irreversible damage. 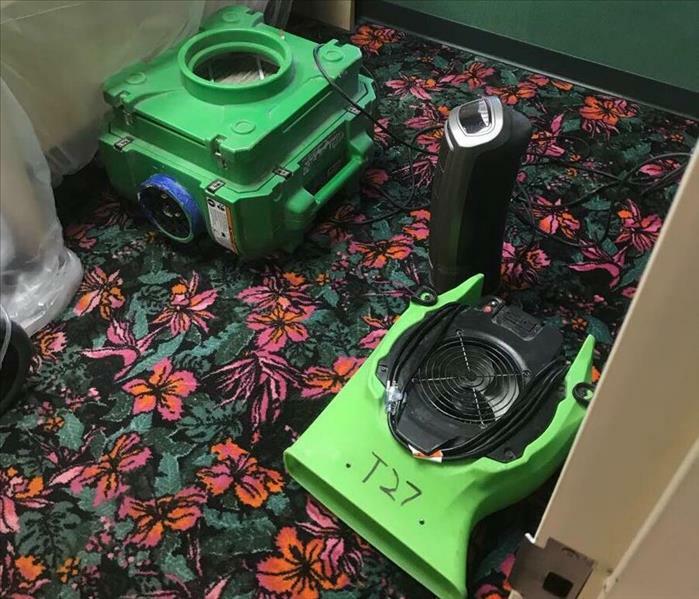 These air scrubbers were used to clean air from smoke damage, after our crew extracted water from the carpet, and also used fans placed to complete drying process at the same time! This photo is a prime example of what can happen when mold is left untreated and given the opportunity to expand. In this house particularly, mold was fond in the basement boiler room and left untreated, which turned out to be detrimental to the house. It quickly spread to the entire home, infiltrating all the way up to the attic. It took this home a full mold remediation in order for things to go back to normal. 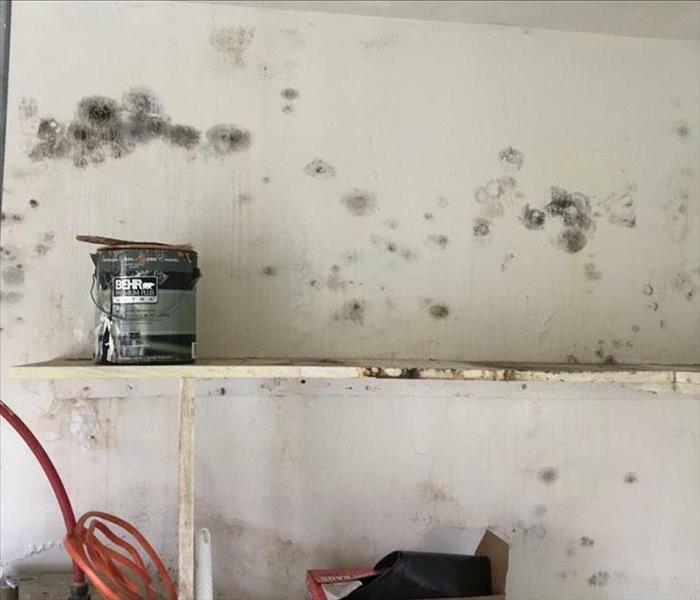 In addition to causing a ton of damage to your home, untreated mold can also have negative health effects as well and should be handled as soon as possible. 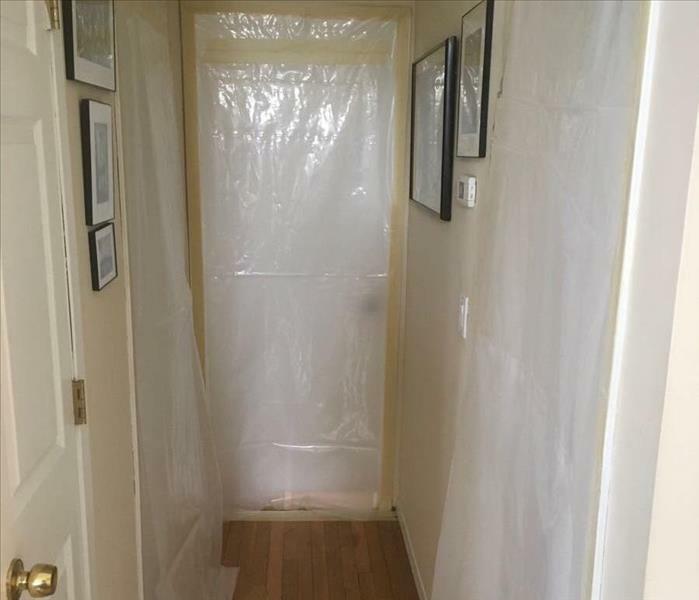 We are prepped to handle any type of mold damage. We go to great lengths to protect your home or commercial property, as well as the health of those who are inside of it! Getting you back to business, serving your customers, is one of our top our priorities. If your office sustains damage, call us at any time of the day or night, 24/7/365. The affects of a fire can reach far beyond the site where it occurred. 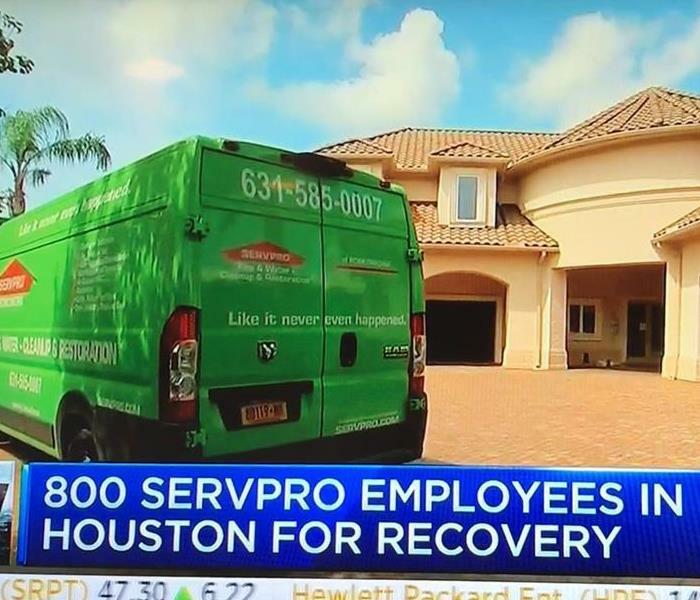 Contact SERVPRO of Ronkonkoma to have our team on site to start the cleanup process fast. We have the experience and training to handle the complete job from start to finish. 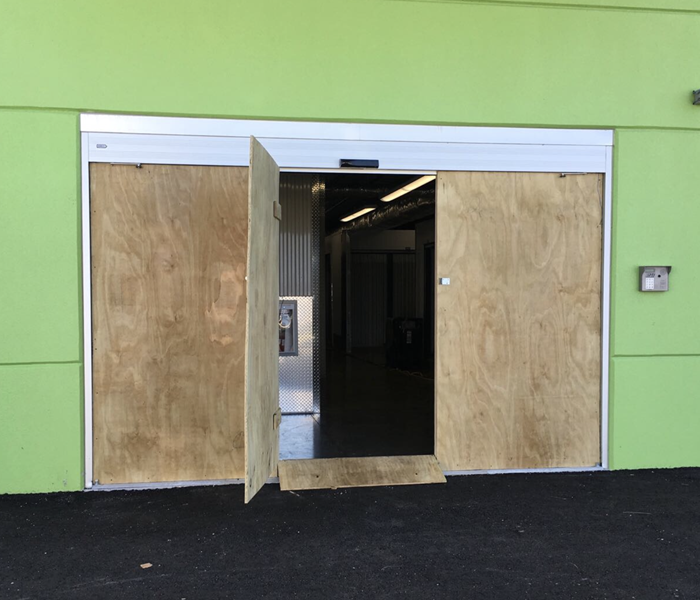 When this self-storage facility was damaged by a hurricane, they called us to board up and secure their space. If you sustain window damage, call SERVPRO of Ronkonkoma at 631-585-0007, and we will be there to secure your space. It’s important to know that mold forms quickly, can be a variety of colors and can often be detected by an unpleasant odor. The bathroom is a prime breeding ground for mold, since moisture can build up if the room is not properly ventilated. Call us as soon as you have any sign of mold, if left untreated, it can cause serious health issues. The kitchen is where more home fires occur than anywhere else in the home. 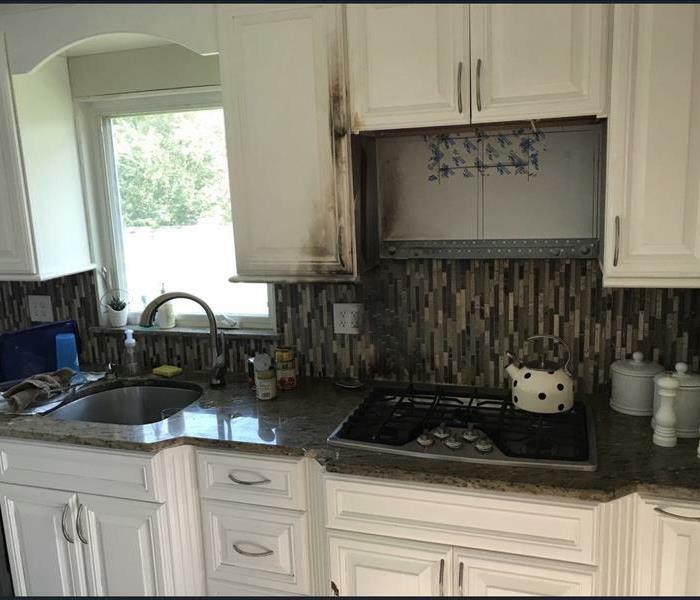 To avoid a kitchen fire keep your cooking area clear of items that can catch fire like pot holders, oven mitts, wooden utensils, paper or plastic bags, food packaging, and towels or curtains. 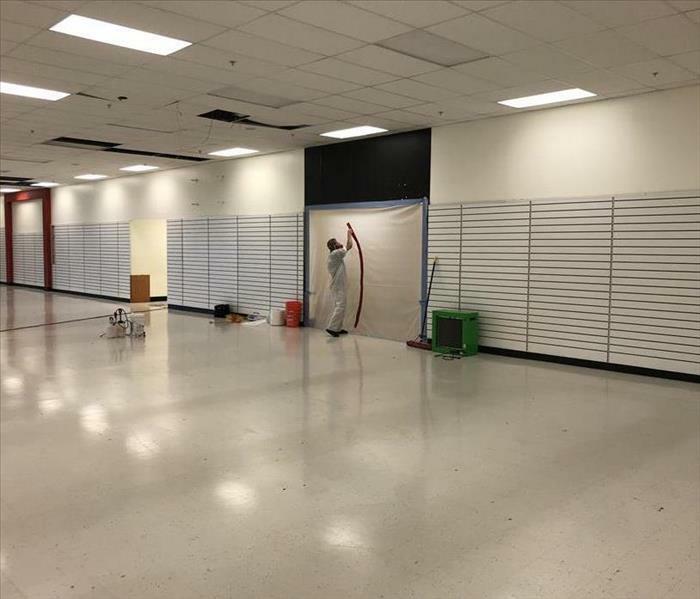 Due to Hurricane Irma, this retail location sustained severe water damage. 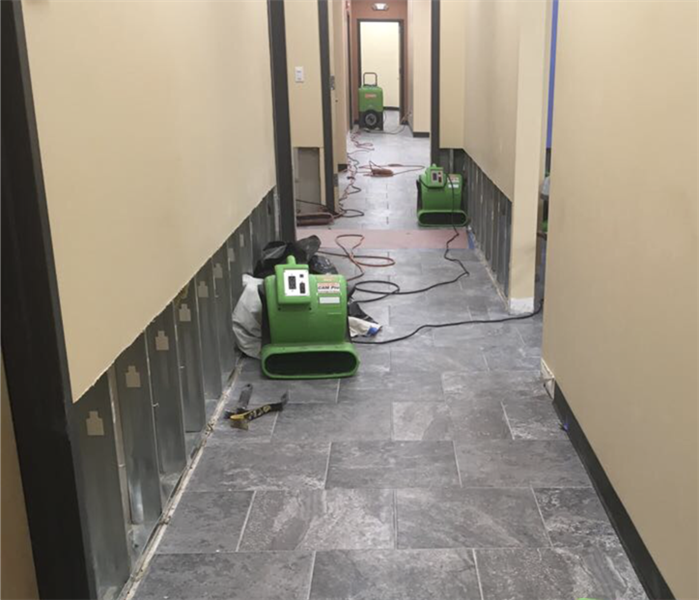 Dehumidifiers and air movers are important pieces of equipment used in properly drying a space after water damage has occurred. 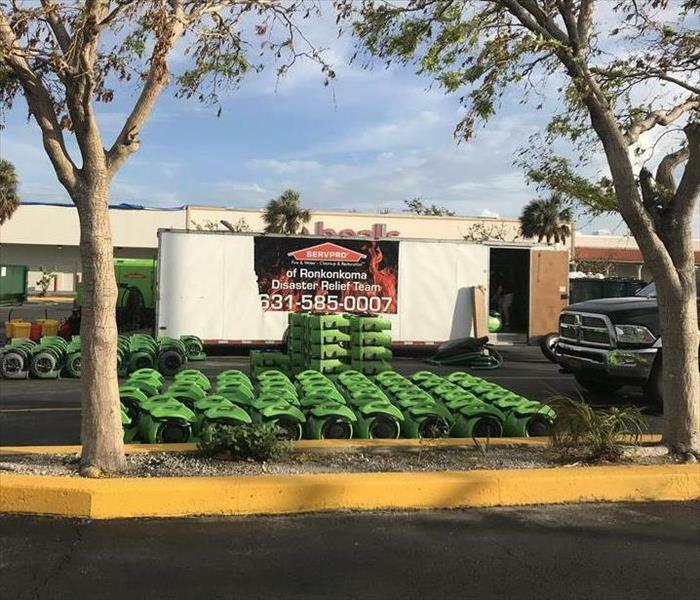 No job is too big or too small for us, we have what it takes to handle it all and get your space ready to get back in business. 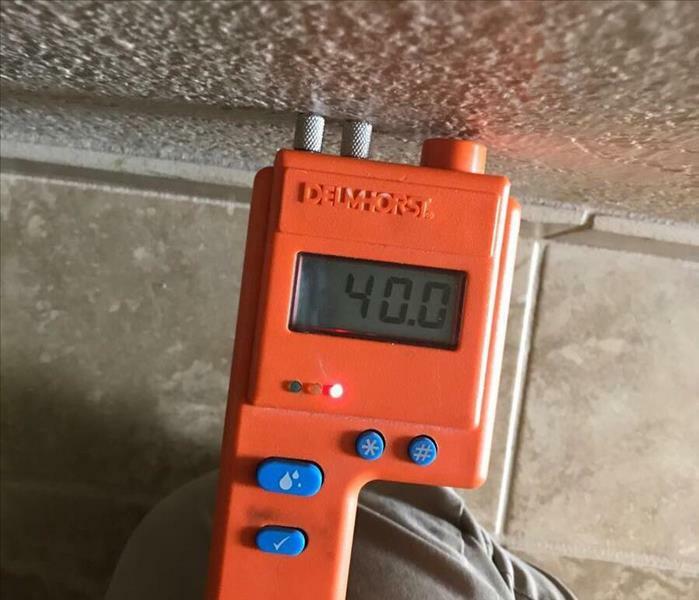 Taking a moisture reading as soon as we arrive at a home with water damage, allows us to deeply assess the home and advise the homeowner what will be necessary to dry out the area affected. We continue to monitor the area throughout the entire remediation process. During the mold remediation process, “air-scrubbers” and HEPA vacuums may be used to prevent the spread of mold spores. This special equipment helps us remove mold spores from the air. As a commercial property owner you may think about water damage coming from flooding from extreme weather. 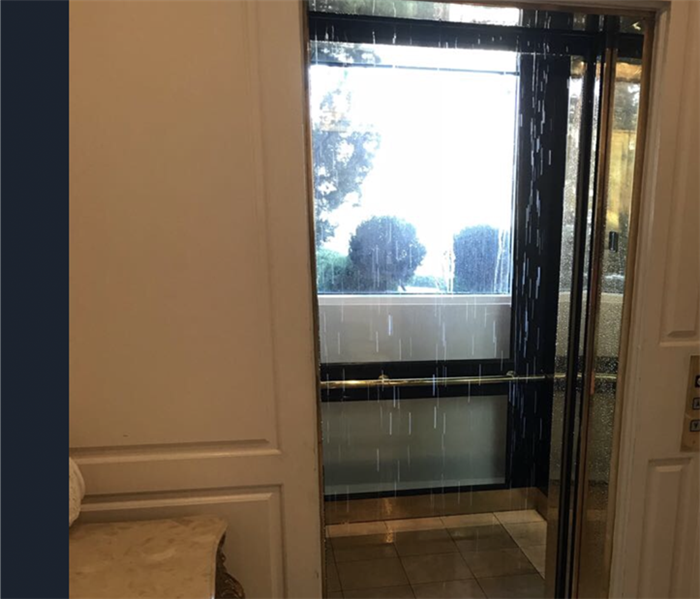 However, the more common causes of commercial water damage comes from outdated sprinkler systems, appliances that use water and, broken pipes and plumbing. 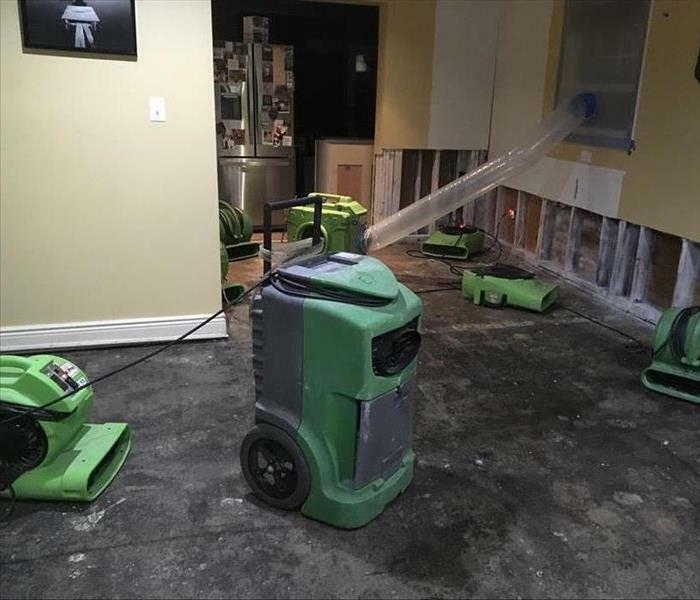 No matter how big or small the water damage is to your home or business, we have the equipment and team to clean your space and leave it "Like it never even happened." Mold spores can quickly grow into colonies when exposed to water. 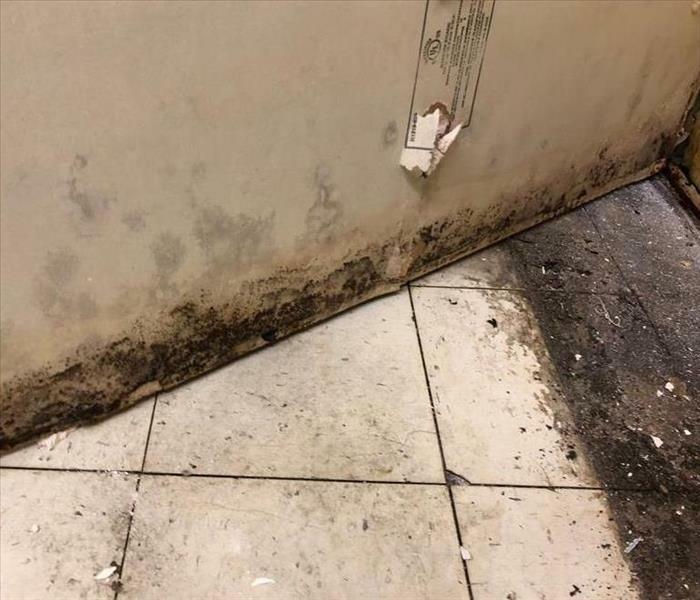 If you notice mold in your home or business, call us so we can help you discover any sources of water or moisture causing the problem and then immediately begin remediation. A fire, where your items are being stored during home reconstruction, can be as devastating as if it were in your home. Wherever it is that you need us, we will be there to help. 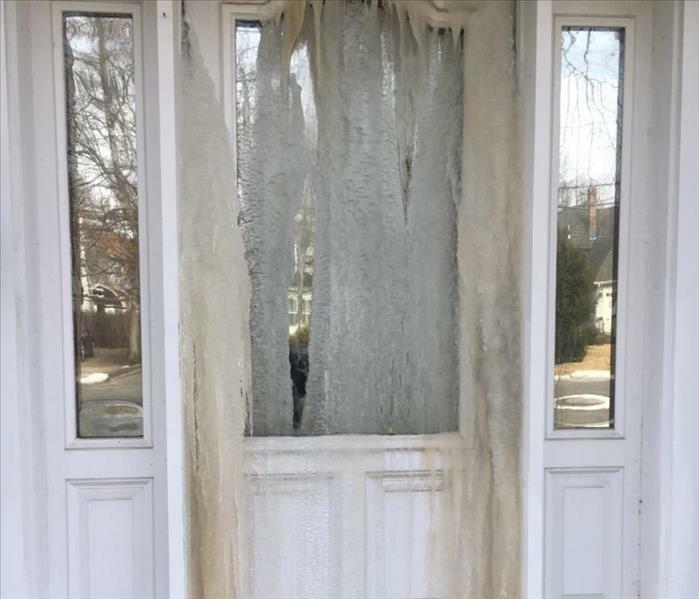 We hope you never come home to see your front door looking like this. If you do, call us and we will safely handle the water damage issues associated with this chilling problem. Management at this local retail location knew they had a big job ahead of them when they found mold in their space. 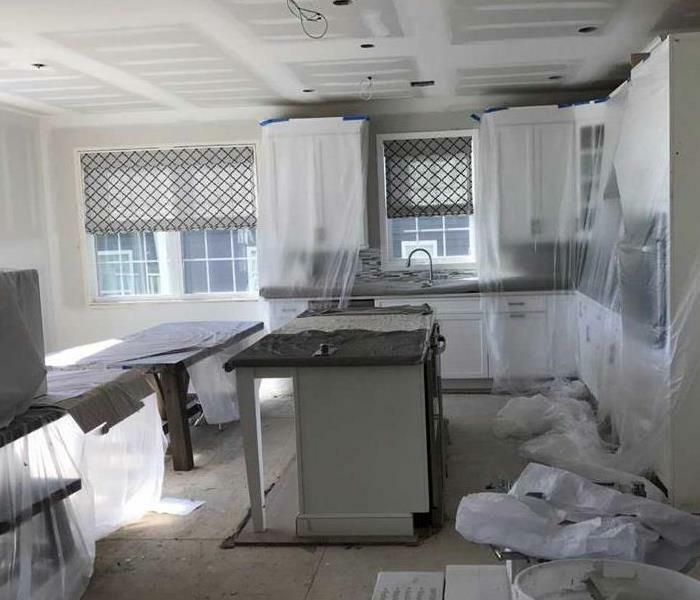 SERVPRO of Ronkonkoma properly contained the area before beginning the remediation process. We have all the tools and skills necessary to repair fire damage in your restaurant. Accidents happen, but you can't let them ruin your revenue! We will take all the necessary steps to repair fire and water damage to get customers enjoying their meals in no time! The legendary Savoy Hotel in Miami Beach looked a lot different after Hurricane Irma was done with her. This photo was taken just days after the storm while our team members were starting the early stages of storm damage restoration. We will have her looking as good as new in no time! Hurricane Harvey left thousands without homes and businesses and we were right there to lend a helping hand. Storm damage, water damage and the threat of mold were a major factor, but we went in and got the job done. It's like we always say, we're just "Faster to Any Size Disaster," and the damage down there certainly qualifies as disastrous. Hurricane's Harvey and Irma devastated the Florida and Houston areas but our Disaster Relief team was there to provide aid. We cleaned up both residential and commercial properties and gave those affected some peace of mind. This was a truly rewarding experience for our team! If your kitchen or any room in your home is damaged by a pipe burst or other plumbing issue, the SERVPRO of Ronkonkoma team can help. We will have things back to normal in no time and make it "Like It Never Even Happened." 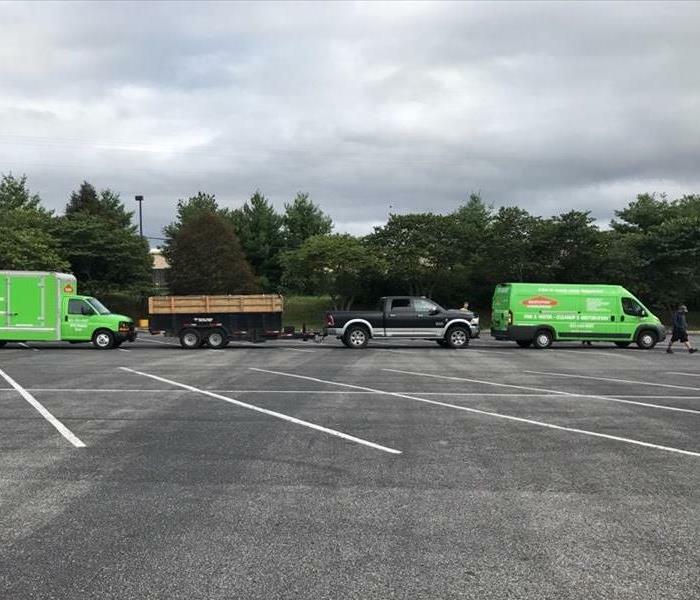 The professionals at SERVPRO of Ronkonkoma are "Faster to Any Size Disaster"! We are dedicated to responding immediately when you need help with water damage from a storm because we know an immediate response is critical to help minimize damage and the costs associated with cleaning and restoration. 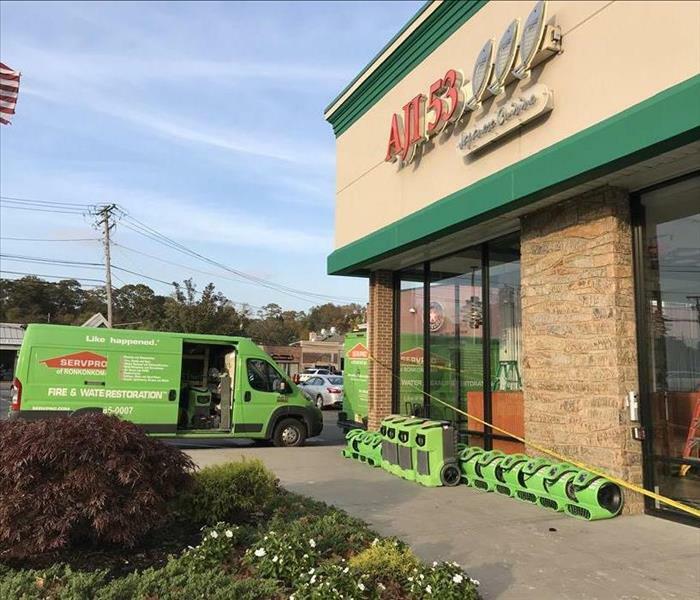 When storm damage brings your business to a halt, our trained technicians have the expertise, knowledge and equipment to solve any water damage you have, and get your business back up and running quickly. 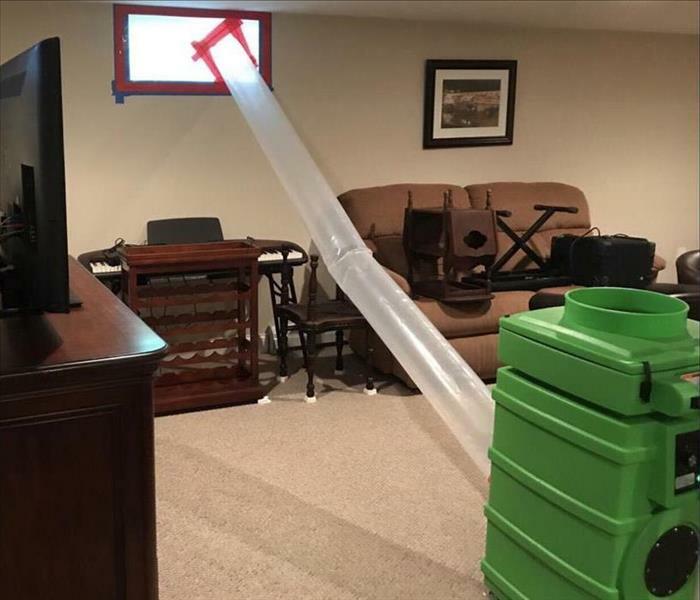 We use Industrial-grade dehumidifiers and air movers to dry your property, prevent secondary water damage and restore it to pre-damage condition. 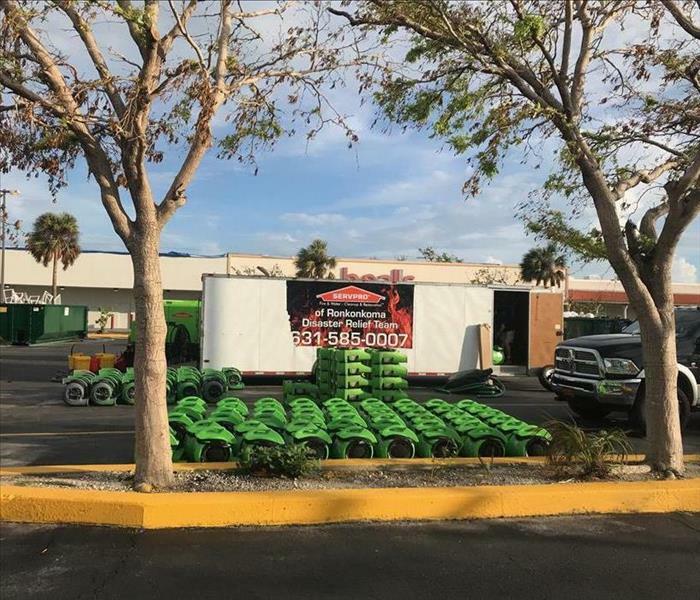 Don't let your business be shut down because of storm damage, call the experts at SERVPRO of Ronkonkoma!